Here is some very rare footage of Classic Contests shot by one of our USA cameramen in the 60s. 1981 IFBB Mr. Universe (Amateur World Championships) from Cairo, Egypt. This last segment of 10 mins is great quality as it was shot on video with live sound. The Overall Winner was Lance Dreher, USA. Naturally these segments are all excerpts, and are mostly film to video transfers, with music added. Do not expect the quality to be HD, as these contests were shot under very difficult lighting situations with the technology that was available at the time. The first 50 mins are only average quality. However this DVD is a priceless record of a piece of history that otherwise would have been lost. We are not listing contest results as this is not a contest DVD production in the way they are done today. 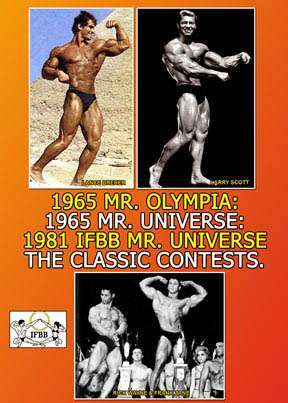 Enjoy 60 minutes of pure bodybuilding nostalgia from the early days of bodybuilding contests on film and video.